Oak Wilt Season is Here! In recent years, a fungal disease called oak wilt (Ceratocystis Fagacearum) has infected oak trees in the area. The disease can develop in the red and white oak groups including northern red oak, pin oak, black oak, white oak, swamp white oak, and bur oak. The disease moves through the vascular system (water conducting system) of the tree. 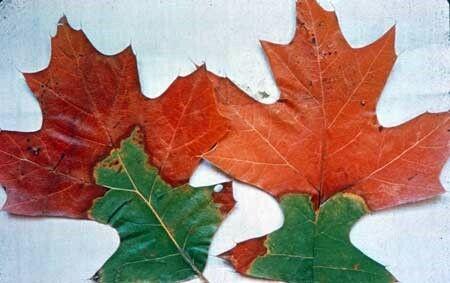 Once infected, the leaves at the top of the tree will begin to brown. Whole branches may yellow and then brown as the disease moves down the branch. Leaves will begin to fall off and a fungal mat will grow under the bark causing the bark to crack. The tree will eventually be unable to move water through its system and will die. Red oaks can die within a few weeks once infected. Trees trimmed between April 15 and July 15 can emit a sap which attracts small beetles. These beetles can bring the fungus from infected trees (including those killed last year) which in turn can infect the recently pruned tree. Through already infected root grafts between trees of the same species. Therefore, if there are several oak trees near each other, it is possible the disease will be passed through the roots. Oaks within approximately 100 feet of each other can contract the disease in this manner. Through movement of infected wood (i.e. fire wood, branches greater than 2” in diameter). If moved to another location, the spores from the infected fire wood can be transferred to healthy recently pruned or damaged oaks in the new location. Avoid trimming oak trees between the growing season of April 15 to July 15. If trees are damaged by a storm or must be trimmed afterward, a tree wound dressing should be applied immediately before the sap which attracts the beetles is emitted. Do not move firewood from infected trees. Any infected wood being moved should be debarked to avoid fungal mat and completely covered in a minimum 4 mil plastic until the end of the growing season. Cut any root grafts when other oaks are near the infected tree. A certified arborist can also be helpful in identifying and treating oak wilt. Depending on the progression of the disease, there may be additional options available. There are other issues that can be mistaken as oak wilt. To report a suspected oak wilt site, email DNR-FRD-Forest-Health@michigan.gov or call 517-284-5895. Residents may send samples to MSU Diagnostic Services for identification as well. Additional information is located at http://www.pestid.msu.edu/ or by calling (517) 355-4536.